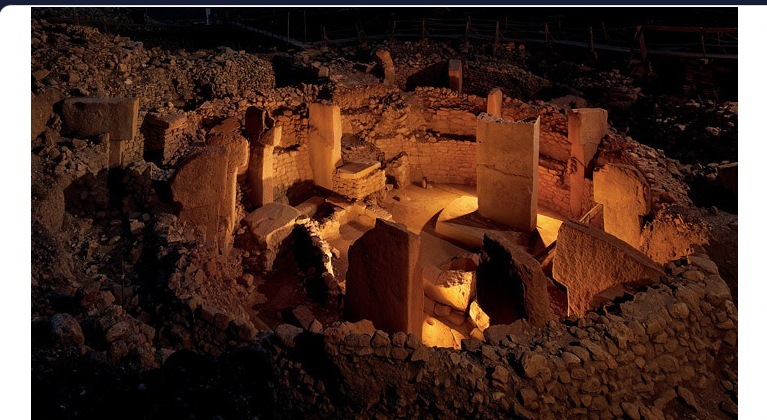 The megalithic temples of Göbekli Tepe, Turkey were first unearthed in 1994 after a local farmer's discovery of large rectangular limestone blocks protruding from the dirt. Two decades of archeological excavations have yielded Paleolithic artifacts and exposed psychoacoustic architectural features seen at other megalithic sites like Stonehenge. 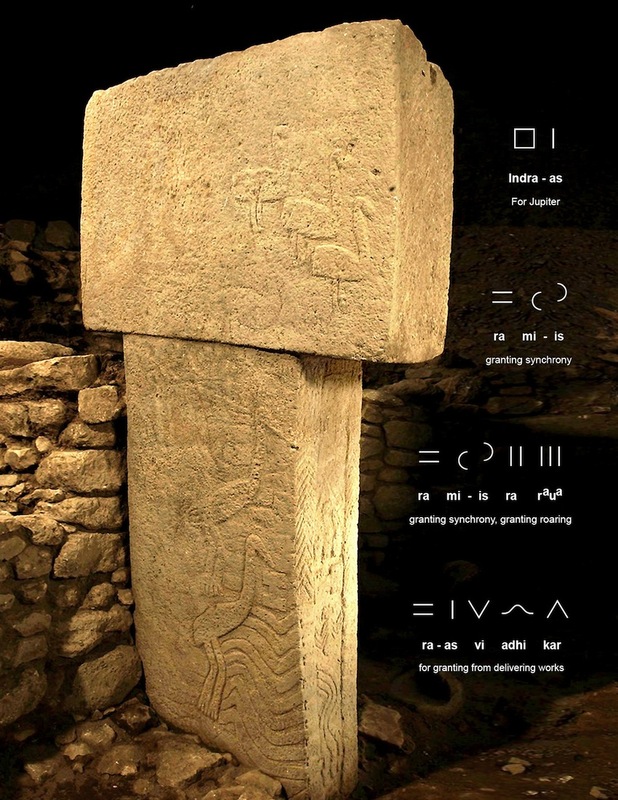 The open format of Göbekli Tepe is reminiscent of the limestone temple enclosures of Malta, yet displaying dozens of inscribed animal pictograms and hieroglyphs. Göbekli Tepe, Turkey (37.223°N 38.922°E) is 672 miles from the Great Pyramid at Giza, Egypt, comprising 2.70% of the Earth's mean circumference. 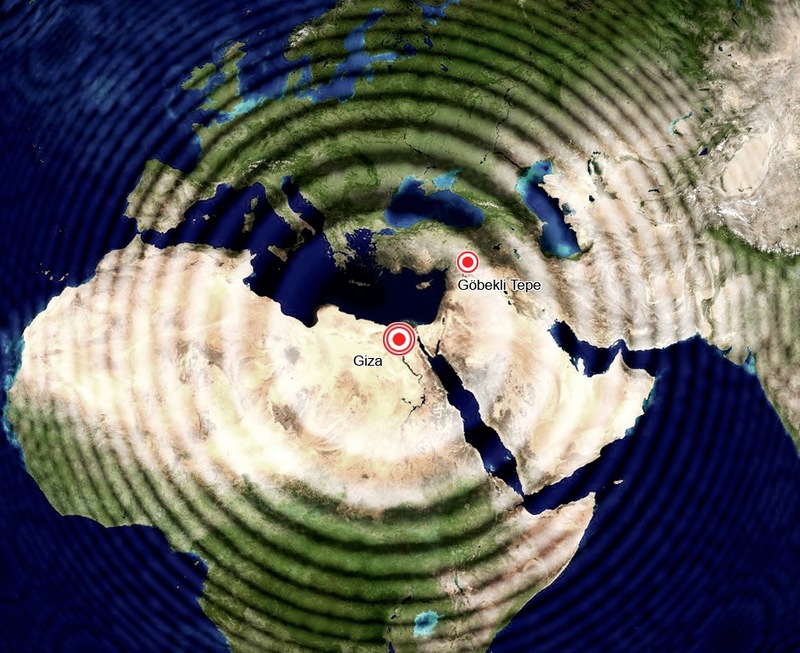 The site sits roughly the same distance from the Giza pyramids as the ancient temple at Nemrud Dag, Turkey, approximating the values of Fibonacci #133 (279...) in percent distance of Earth's mean circumference, and Fibonacci #355 (694...) in miles. Excavations at Göbekli Tepe have revealed complex configurations of dozens of 'T'-shaped standing stones arranged within several adjacent circular enclosures ringed by high walls. Many of the massive standing stones are carved with fascinating symbolic representations in relief, composed of many distinct zigzag waveforms and animal forms --snakes, scorpions, lions, foxes, boars, birds and aurochsen. The highly geometric forms of the megaliths and idealized animal pictograms adorning them correspond closely to geometric language forms of the worldwide Paleo-Sanskrit culture, associated in every region of our planet with monumental piezoelectric temples dedicated to the planet Jupiter. Identified as the Divine One, the giant planet Jupiter was signified all over the world during the Paleolithic Era by the square Indra glyph, reflected in the square or rectangular format of the top portions of the megaliths at Göbekli Tepe. The lowest levels of ancient occupation at this sophisticated megalithic temple site correspond to an extended period of primary use involving limestone basins that were also shaped in the square format to signify the deity imparting the benefits by resonant infrasound focused at that site by the Great Pyramid. The high calcite content of the piezoelectric limestone enabled efficient transduction of acoustic and mechanical energy into an electrical charge that was applied for water purification and lightwater levitation. Acoustic separation of protium from deuterium was also achieved by water levitation basins around the pyramids and within passage chambers like Gavrinis, Newgrange, Knowth and Dowth. Laboratory analysis of the limestone surfaces of the square basins revealed the presence of oxalates, leading to speculation about beer production. 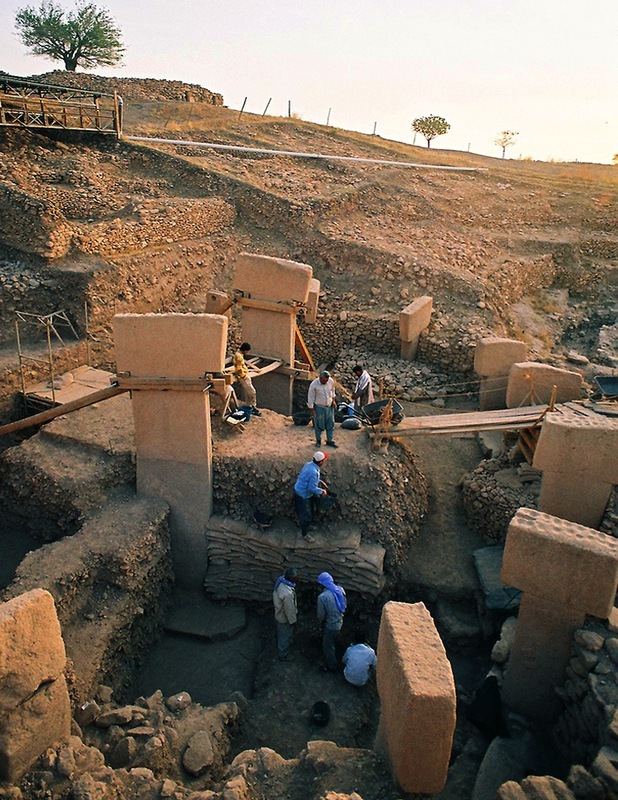 However, the presence of oxalates results from geopolymer stone casting processes employed at Göbekli Tepe to produce megaliths from a liquid slurry of sand, fly ash and water. Oxalic acid was used to chemically disaggregate available bedrock into fine grains. In South America, oxalic acid residues were identified on the Saqsaywaman temple megaliths, and on the surfaces of the Tiwanaku Gate of the Sun. 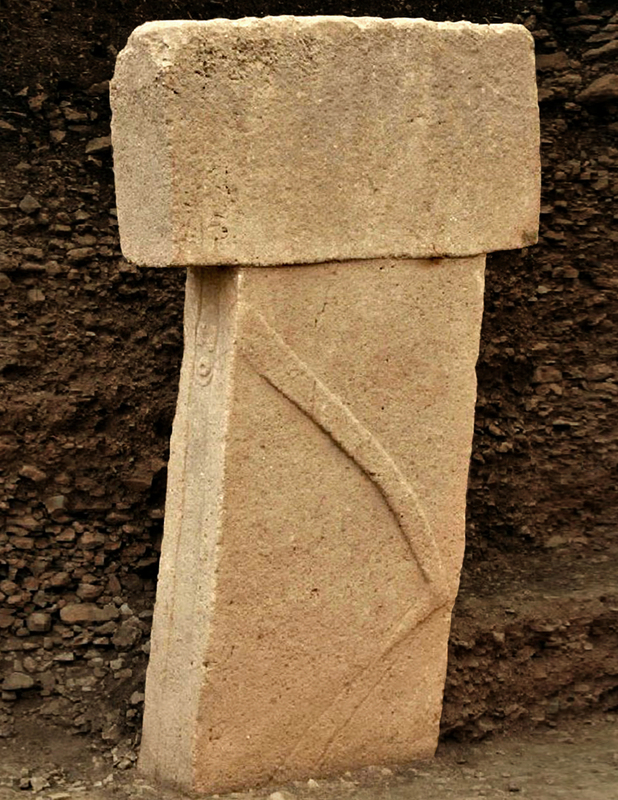 Göbekli Tepe's standing stones also retain residual oxalates. One of the water receptacles was given the square Indra format divided into a double basin (above). The resonator's raised perimeter shows a series of cupules visually creating a line of dots that served both a functional role and a symbolic role as writing. The bold geometric composition of the double basin provides a glyph ligature reading: Indra ra * * * * * , meaning "Jupiter granting, the one, the one..."
A similar phrase showing a square above a line of dots reading Indra * * * * * has been identified on the walls of Lascaux Cave, France, airbrushed in black charcoal paints onto geopolymer walls that had been carefully prepared and whitewashed. 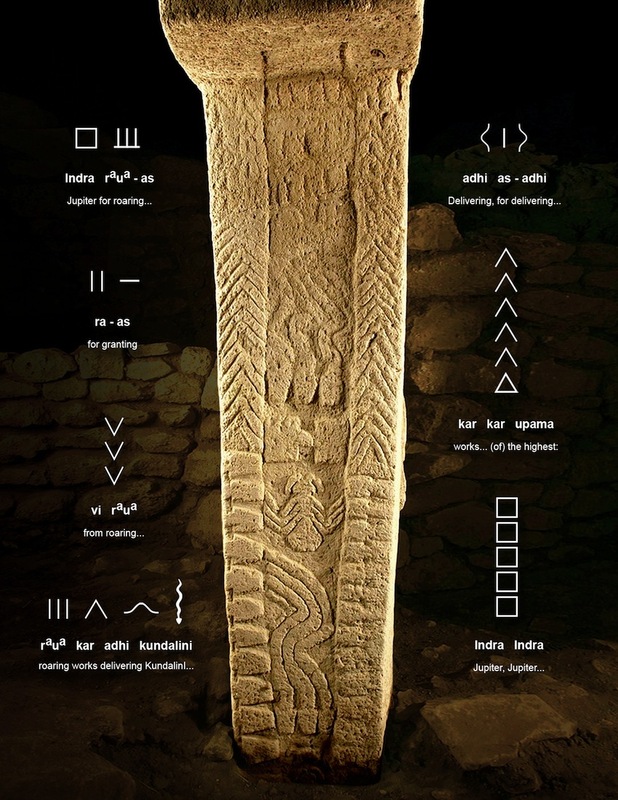 This clear linguistic continuity between Lascaux Cave at ~30,000bp with the megalithic circles at Göbekli Tepe constructed ~15,000bp deny the repeated denials of mainstream archeologists regarding the Vedic cultural identity of the Paleolithic builders of Göbekli Tepe. 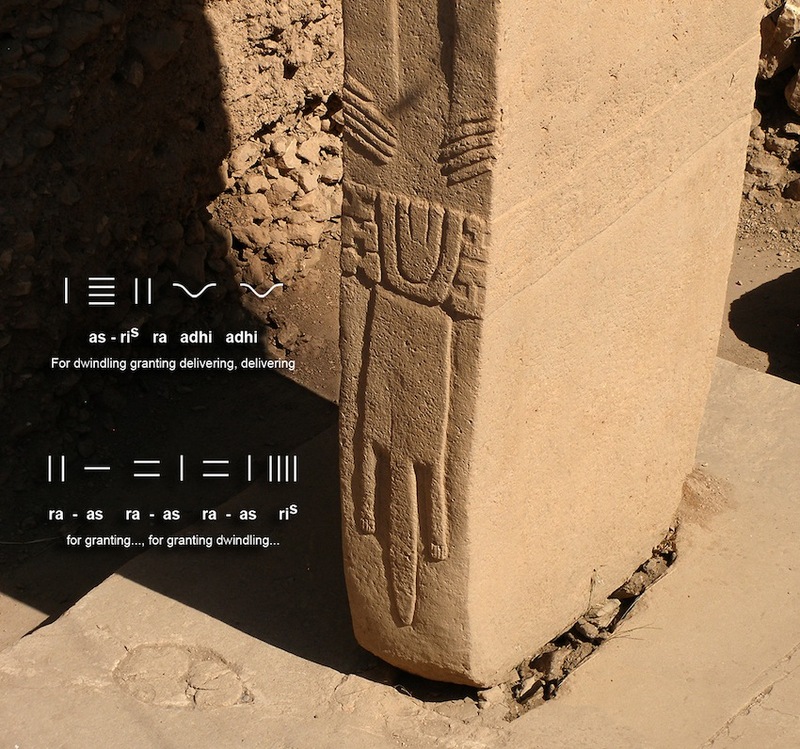 Elevation of the deified planet Jupiter as primary benefactor of life and consciousness on Earth was also expressed at Göbekli Tepe in the square format of the tops of the standing megaliths that correspond to the Indra glyph. 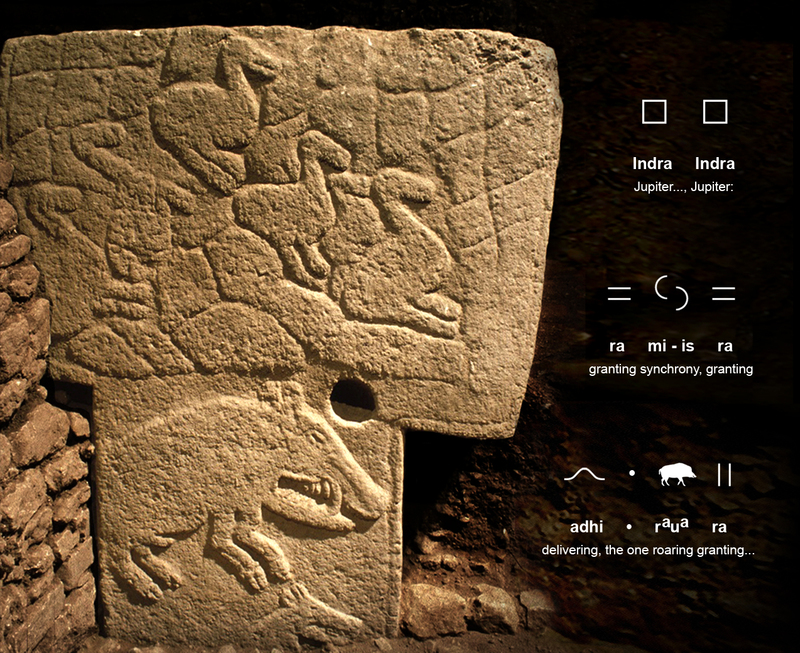 A lion rendered in 3-D on one megalith adds to glyph texts reading down the side face: Indra-as ra raua ris adhi , meaning "For Jupiter granting roaring, dwindling delivering..." (above). 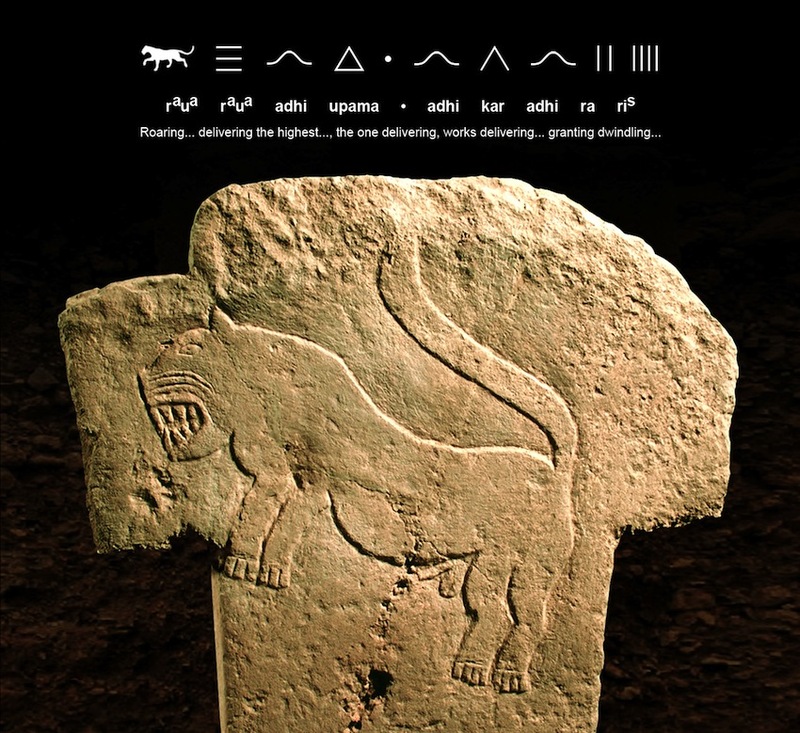 As painted deep in Chauvet Cave, France, roaring lioness pictograms were inscribed on several standing megaliths at Göbekli Tepe, reading: raua raua adhi upama * adhi kar adhi ra ris , meaning "Roaring, roaring..., delivering the highest..., the one delivering, works delivering, granting dwindling..." (above). 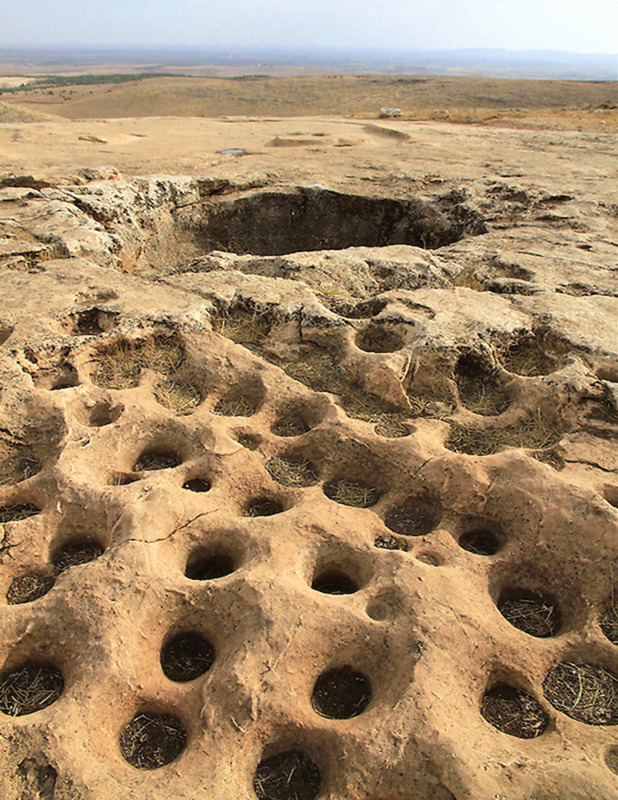 Deep pitting visible on the tops of the megaliths was produced by repeated hammerstone strikes by later Neolithic societies, when Göbekli Tepe was filled in by limestone rock debris and sand. Quartz sand aided in the purposeful secondary Neolithic use of the temples as giant resonators generating infrasound by striking the tops of the standing stones. The same Paleolithic primary construction period and Neolithic reconstruction periods are witnessed at the pyramids of Visoko, where the Ravne tunnels show distinct phases of primary excavation over 30,000 years ago, then backfilling by much later Neolithic cultures. The largest standing megalith at Göbekli Tepe is covered with pictograms representing a human figure with reflected standing waves for arms, leading to a pair of hands above a belted animal-skin loincloth (above, only partly excavated). Embodying Indra, glyphs below the rectangular head state: Indra ra * ra-as nau adhi , meaning "Jupiter granting, the one for granting, spaceships delivering" (above). 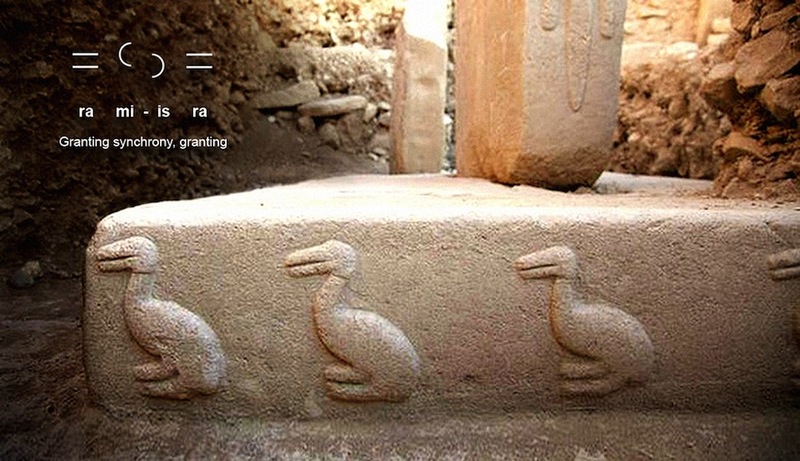 Another hieroglyphic ligature represented below the large figurative megalith is the pictogram of a duck reiterated in a row along the limestone base platform, reading: ra mi-is ra , meaning "Granting synchrony, granting" (above). 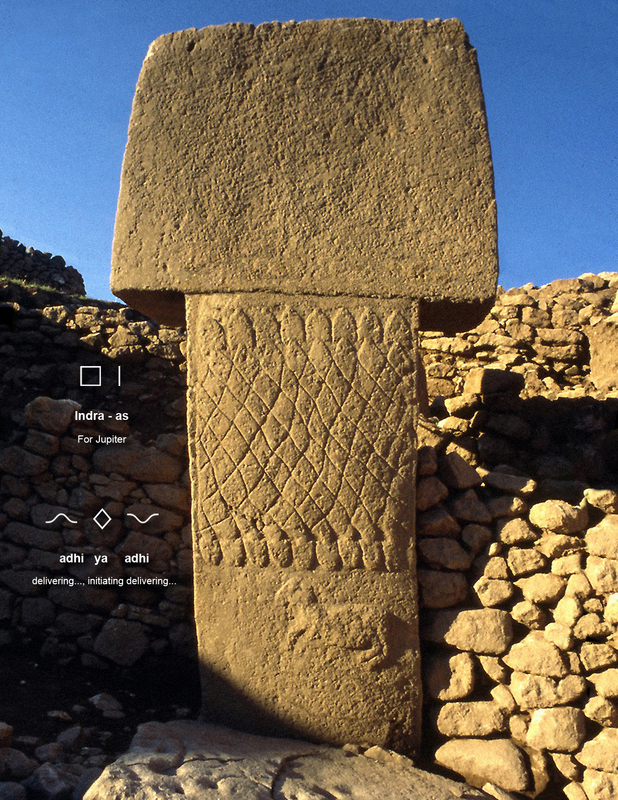 Sacred pictograms of ducks or waterfowl also adorn other megalithic standing stones at Göbekli Tepe, and provides a physiological explanation of the temples' psychoacoustic effects. 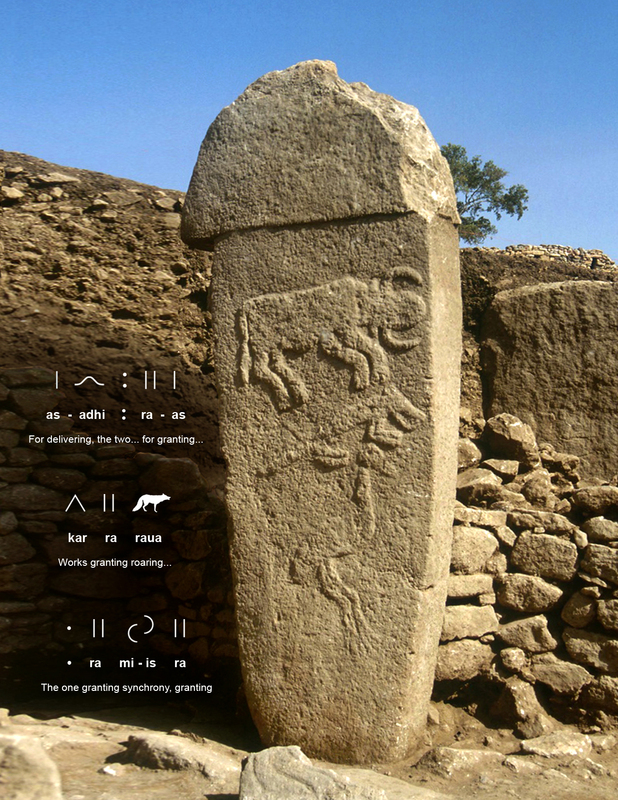 The lower part of the anthropomorphic standing stone displays a pictographic statement designed as hands, a belt and an animal-skin loincloth, together reading: as-ris ra adhi adhi ra-as ra-as ra-as ris , meaning "For dwindling granting delivering, delivering for granting..., for granting dwindling" (above). A wall-supported megalith provides a lengthy set of pictographic texts covering multiple sides in vertical columns, designed with a well delineated square top signifying Indra , the planet Jupiter. 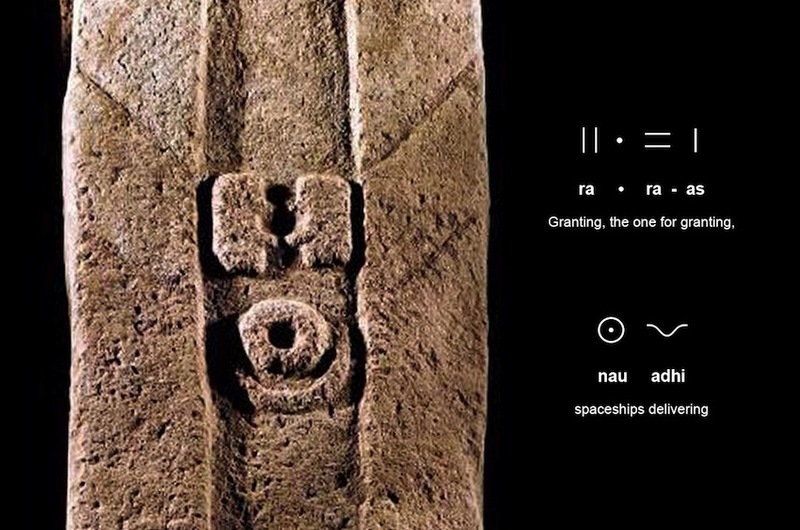 The broad side of the megalith text reads from top to bottom as: Indra-as ra mi-is ra raua ra-as vi adhi kar , meaning "For Jupiter granting synchrony..., granting roaring, for granting from delivering works" (above). The narrow side of the megalith text provides hieroglyphs reading from top to bottom, down the central column: Indra raua-as ra-as vi raua kar adhi kundalini , meaning "Jupiter for roaring..., for granting from roaring works delivering Kundalini". The slightly recessed central glyph column is accompanied by a pair of flanking columns with repeating vertical lines of glyphs reading: adhi as-adhi kar kar kar kar upama Indra , meaning "Delivering, for delivering..., works, works... (of) the highest: Jupiter, Jupiter..." (above). Animal pictograms were carved in relief on the square format of the top of another megalith, along with squares in rows signifying Indra, with a scorpion pictogram with legs presenting the asu glyph for 'life' (above). The exposed glyph text provides an explanatory statement for beneficial effects on male reproductivity: Indra-as kara vira Indra adhi mi-is kundalini ra-as adhi ra rias asu, meaning "For Jupiter: action of virility..., Jupiter delivering... synchrony (of) Kundalini, for granting..., delivering granting for dwindling life..." The rows of square blocks are linked by 'delivering' glyphs shaped as 3 arched standing waves in Fibonacci size ratio (rediscovered and mathematically modeled by Cervenka et al., 2003). 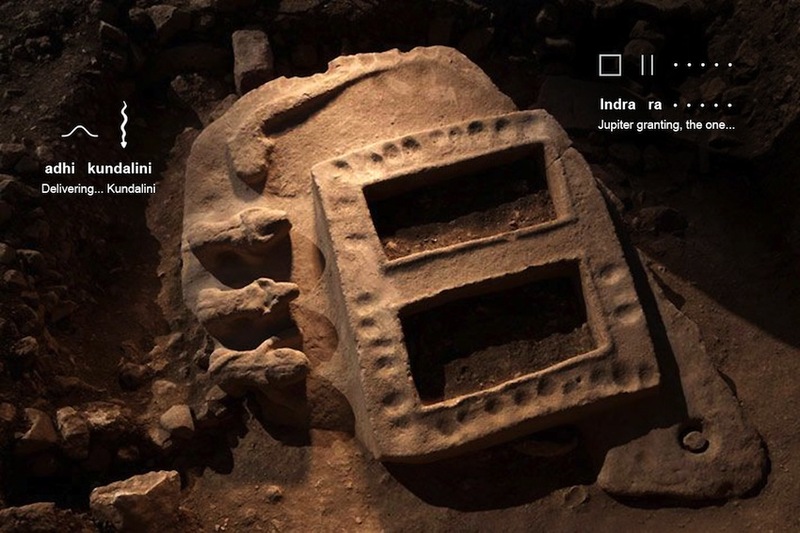 Comparable text adorns another megalith: Indra Indra ra mi-is ra adhi raua ra , meaning "Jupiter..., Jupiter: granting synchrony, granting... delivering roaring granting..." (above). The snarling mouth of the boar pictogram reiterates the raua glyph for 'roaring' while the legs repeat the ra glyph for 'granting'. One tall standing stone was adorned with a mesmerizing pattern of diamond-backed snake forms representing Kundalini serpents, embedded with glyphs reading: Indra-as adhi ya adhi , meaning "For Jupiter delivering..., initiating delivering..." (above). 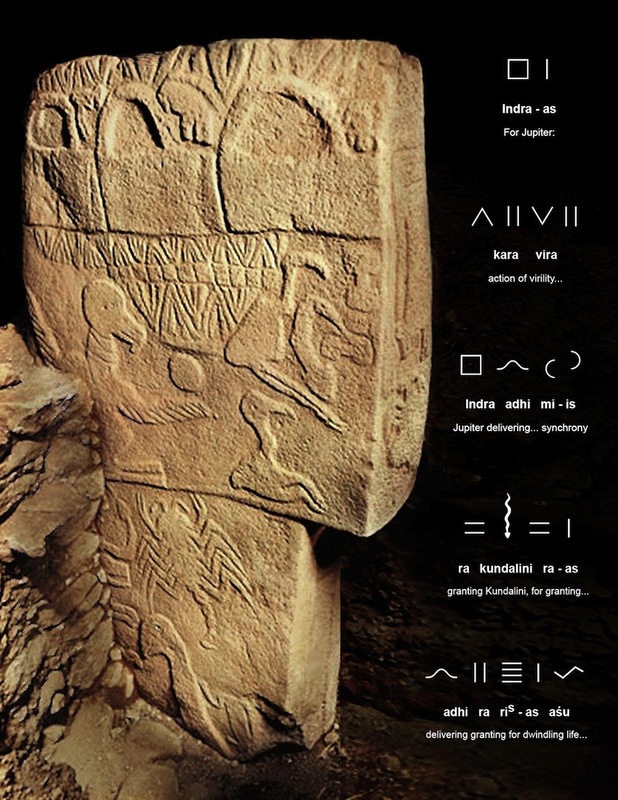 Another standing megalith depicts aurochs, fox and bird pictograms with repeating sets of embedded glyph phrases providing the familiar votive statements: as-adhi : ra-as kar ra raua kar * ra mi-is ra , meaning "For delivering, the two... for granting... Works granting roaring... The one granting synchrony, granting" (above). 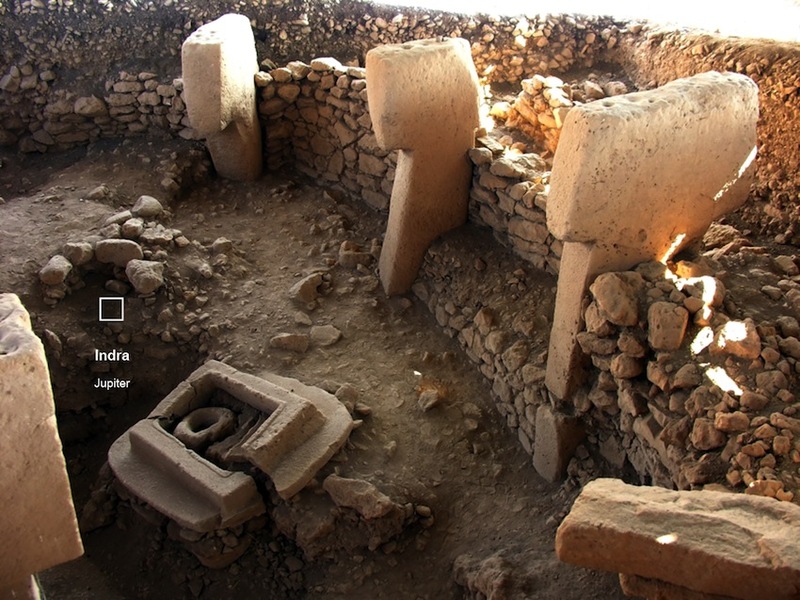 The broad hilltop complex of Göbekli Tepe presents large areas of well-preserved geopolymer limestone cement floors that, along with the dozens of 'T'-shaped megaliths themselves, have been mistaken by onsite archeologists for natural bedrock carved smooth. Paleolithic knowledge of geopolymer chemistry has been clearly demonstrated at the Visoko pyramids and can be easily ascertained at Göbekli Tepe. 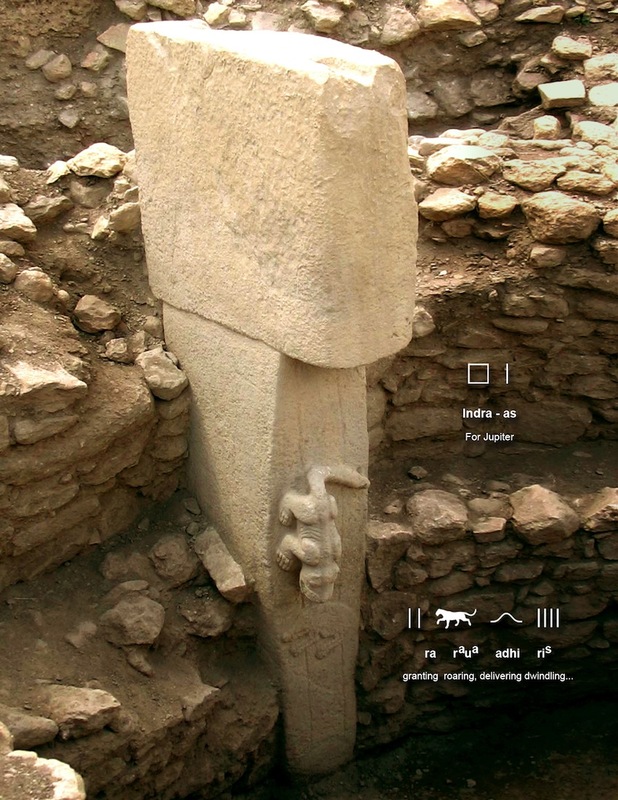 In fact, large man-made cement pads were poured and used for advanced psychoacoustic purposes that have not yet been discerned by modern investigators at Göbekli Tepe. The platforms' smooth surfaces were artificially produced for barefoot contact with sacred piezoelectric stone that transduces infrasound into a localized electromagnetic field for human benefit. 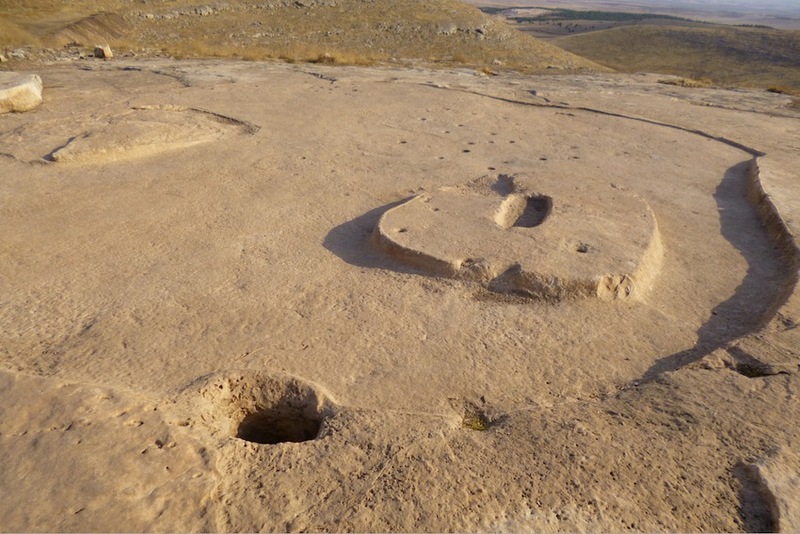 The piezoelectric geopolymer platform was laid out with a specific plan delineating footpaths, curbs and elevated areas around several permanent features including what appear to be large postholes and oblong slots for securing the bases of megaliths (above). The function of large cupules has eluded researchers for many years, and cannot simply be grinding holes since they are found in great numbers marking vertical wall surfaces as well as horizontal surfaces. This conundrum can now be definitively put to rest by accurate cross-referencing of Paleo-Sanskrit texts that provide direct statements from the builders themselves as to the purpose of the extensive temple complex. Cupule marks are the result of repeated strikes by hammerstones against the rockface. Studies replicating the process with comparable materials confirm many thousands of hammerstone strikes were made in the formation of each large cupule, generating electricity as the mechanical energy also becomes transduced. 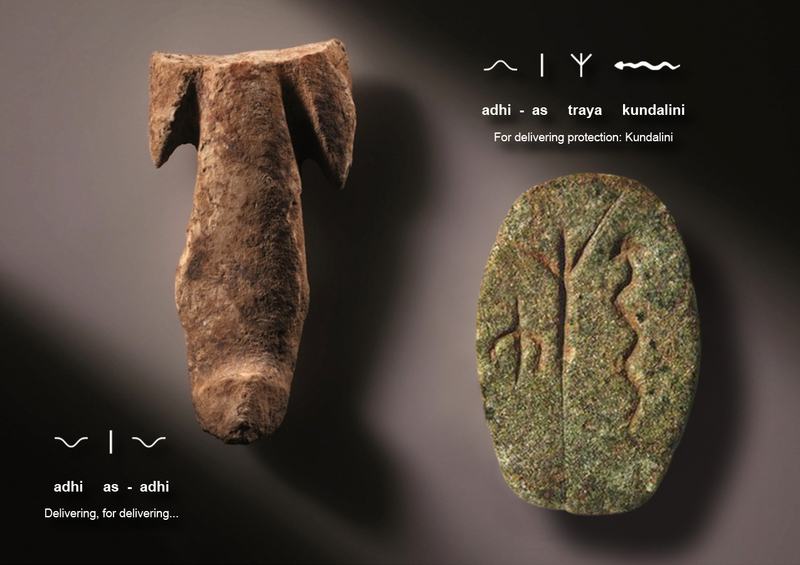 Small sandstone artifacts unearthed at Göbekli Tepe include both masculine and feminine fertility symbols that contain embedded language forms not yet recognized. 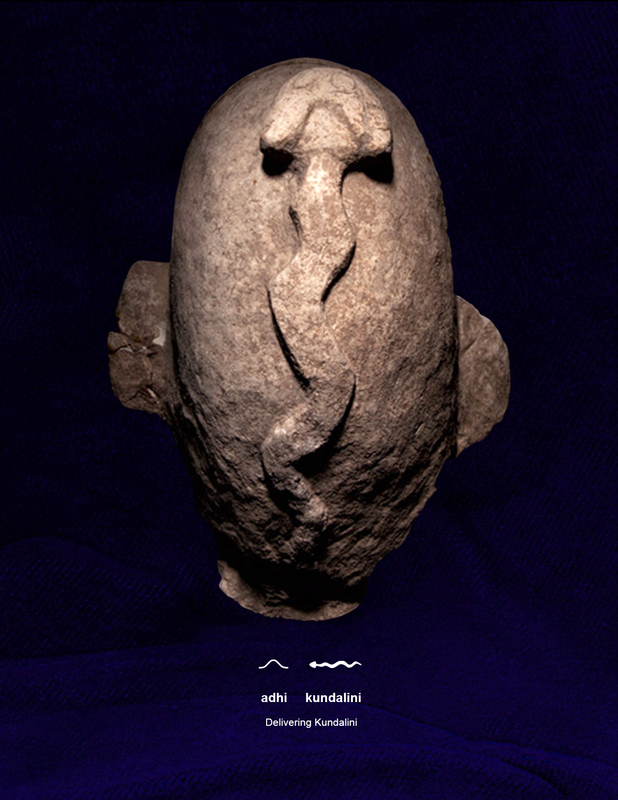 The most anatomically explicit and culturally identifiable representation found at the megalithic ring-walled temple is a symbolic Sanskrit lingam, with the testicles rendered in a flattened format to give the basic glyph phrase in profile view: adhi-as adhi , meaning "Delivering, for delivering" (above, left). A small stone tablet recovered during excavations presents glyphs praising the beneficial effects of electro-acoustic Kundalini meditation practices undertaken at the open clustered temples of Göbekli Tepe, reading: adhi-as traya kundalini , meaning "For delivering, protection: Kundalini" (above, right). This little tablet offers the simplest explanatory statement as to the sophisticated electro-acoustic functions of the piezoelectric temples, which once roared with the reverberations of Jupiter as focused by the Great Pyramid. 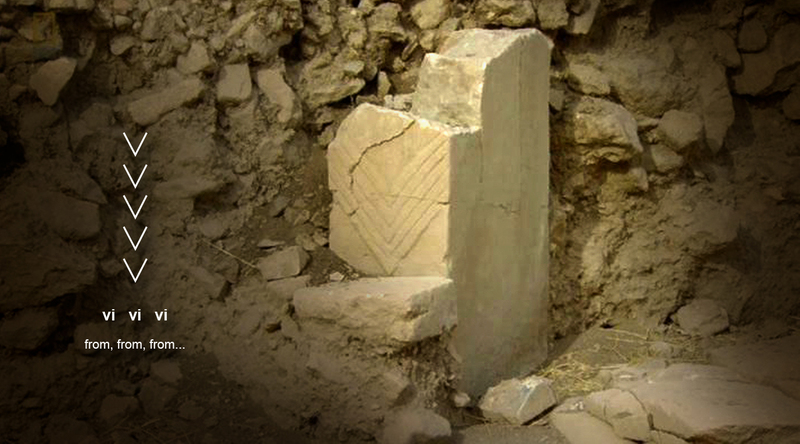 Such clear glyphs carved into this stone artifact surely deserve significant attention from archeologists and epigraphers, yet it is becoming clear that such artifacts are being purposely ignored by Turkish government officials and mass media services because they prove the site's Sanskrit cultural origin. Tight control of academic circles and public statements on Paleolithic sites relates to suppression of pyramid technologies. A smaller-than-life-size sandstone sculpture of a bald head was recovered at Göbekli Tepe, with only basic facial features (above). The electrical movement of energy experienced by adepts during Kundalini meditation under the influence of focused infrasound at megalithic sites is represented by the kundalini snake glyph. The top of the round head shows the serpent glyph rising to the crown chakra, offering the simple glyph statement: adhi kundalini , meaning "Delivering Kundalini." The subject of male fertility is addressed in another hieroglyphic passage embedded in the roughly sculpted forms of a male figure, cast in geopolymer limestone, that terminates in a simple post that was set into the ground. The glyphs read vertically, starting at the head: * * as-adhi vira ris adhi-as , meaning "The two for delivering virility, dwindling for delivering... " (above). Clear and consistent cultural links to the Vedic practices of barefoot bioelectrification and hands-on qi healing that have been well preserved in Asia, but reflect the advanced heritage of a Paleo-Sanskrit motherculture that remains at the root of all spiritual practices worldwide. Hundreds of simple animal pictograms were discovered deep within the Paleolithic caves of Lascaux, Chauvet and dozens of others in present-day France, all constructed using the same geopolymer stone reconstitution techniques. Ongoing excavations at the clustered temple sites of Göbekli Tepe are in the process of uncovering dozens of other hieroglyphic pictogram texts inscribed in low relief that are now only partially visible. One such example of partially buried passages of glyph text is found on a fragmented base portion of a standing megalith that reads: vi vi vi vi vi , meaning "from, from..." (above). The rest of the pictograms will likely be revealed in the coming months and years as the site yields relics from the deepest levels. 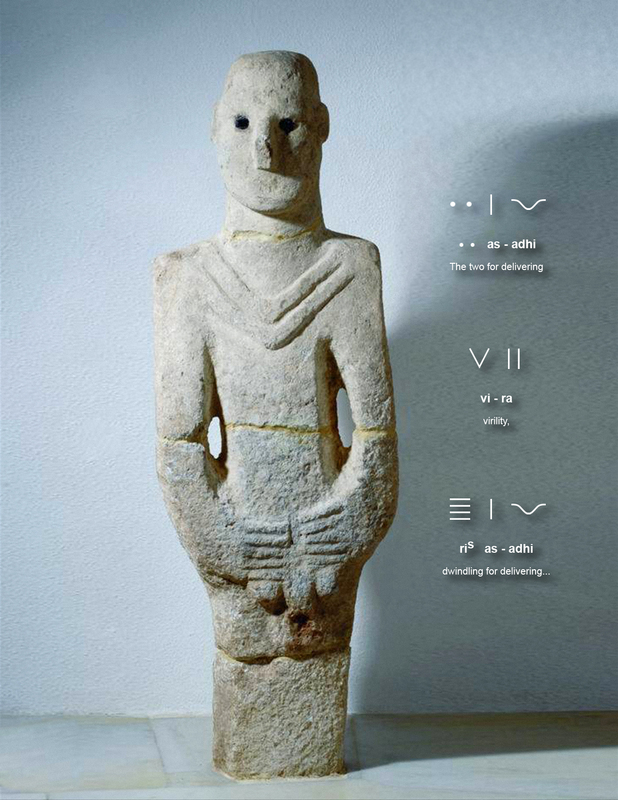 While most archaeologists persist with the misinformation that Göbekli Tepe has no cultural affiliations with other sites around the world, unmistakable evidence of geopolymer stone casting techniques and psychoacoustic architectural styles reveal especially close cultural links to several major ancient sites in the Mediterranean region, especially those open-air enclosures of the Islands of Malta and even more closely matched by temples of the Balearic Islands situated off the coast of present-day Spain. 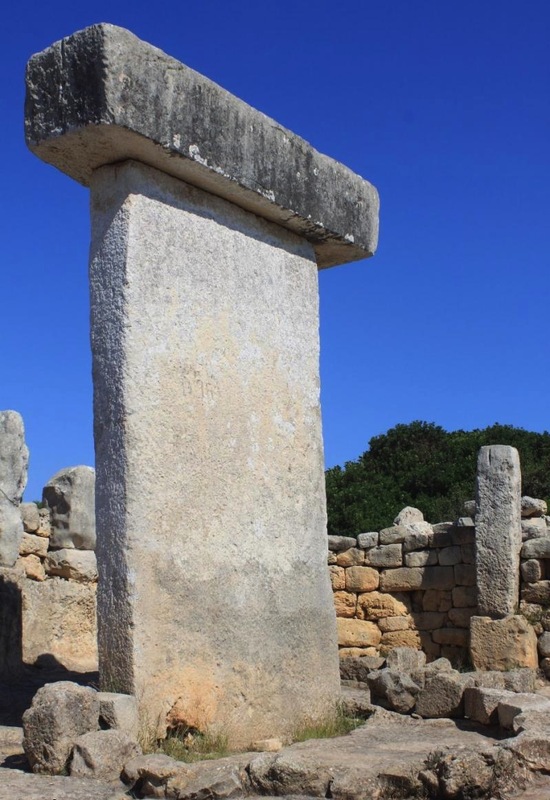 Torralba Den Salord temple (above), on the Island of Menorca (40.00°N 3.85°W), displays a remarkable likeness to the ringed enclosures and standing megaliths of Göbekli Tepe, and also presents the highly selective geoposition for infrasound alignment by its exact resonant location along the 40th northern latitude. 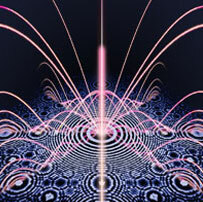 The shared language and technologies confirm these sites are all components of a resonant global oscillator.